Let It Ride Poker by Amaya Gaming is a variation of poker, which is “invented” by Bally Technologies. You may see these games in casinos under the “Shuffle Master” title. 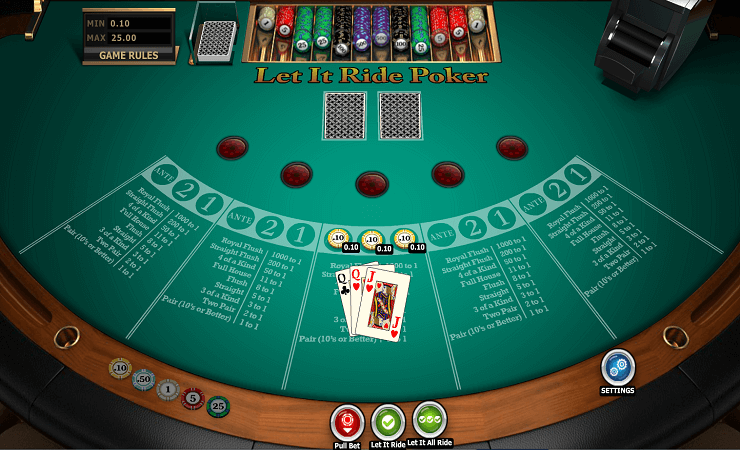 Let it ride is a very simple form of classic poker, and uses some features of the Texas Hold’em poker. Basically, the player tries to form a five hand poker hand by using his three cards and two community cards. You can withdraw for one-third of your initial wager at any time and reduce your wager during the game. But if you don’t withdraw and go all the way in, this is called “let it ride”. The digital version of Amaya Gaming follows these same rules. You don’t play against a dealer, you just try to form a legal poker hand by using five cards. Start with placing your bet, you can do this by clicking on the “ante” section of the table. The bet levels change between 0.10 and 25 coins, and at least 0.10 coin is needed to enter the game. As you can see, the betting box has three sections: ante, 1 and 2. These represent the sections of the game, and the amount you are going to lose if you withdraw. Click on the “deal” button, you will get three cards. Two community cards will get placed in the middle, and you have three options at this point: pull bet, let it ride, let it all ride. Pulling the bet will result with the loss of one-third of your ante wager. Choosing “let it ride” will reveal one of the community cards. If you prefer to end the round, click on the “let it all ride” button – this will reveal all community cards. At the end of the round, if you manage to form a legal hand, you will get paid according to the paytable. You can also place bonus bets at the start of each round, these reward up to 30.000 coins according to the poker hand. Let It Ride Poker by Amaya Gaming is a rare gem – this form of poker usually never transforms into the “digital” world. This is a good opportunity if you are interested in this variation of poker. The game will be a good choice if you want to learn the basics of poker, it is not a complex game. 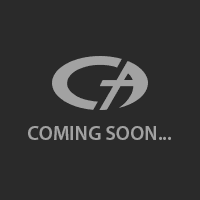 We recommend checking it out, even just to see a different variation of poker.